The insurance adjuster said that I was at fault for the car accident. Is there anything that I can do? Unfortunately, it is very common for a car to get rear-ended so hard that it is forced into the car in front of it. Many people believe that if you rear end someone, you are at fault no matter what – even if you are pushed into the car in front of you. 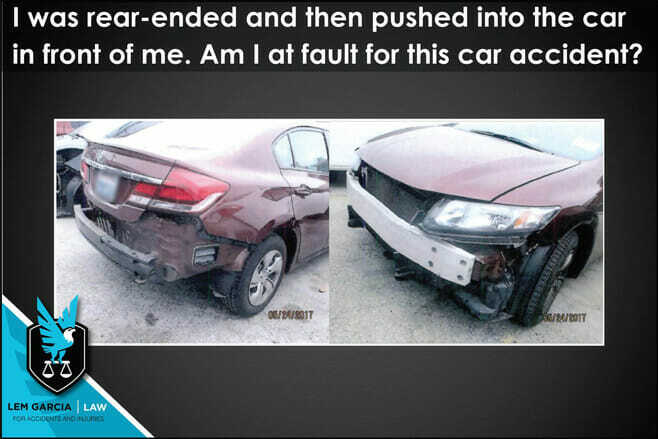 Some people believe that they might be at fault because they should have been farther away from the car in front of them to avoid crashing into them if they are rear-ended. While this may sound logical, it is not true. If you are rear-ended and then pushed into another car in front you, you are not at fault for the crash. The party that rear-ended you at such a high speed that it forced you into the car in front of you is absolutely at fault for the car accident. If the person in the car in front of you claims that they felt two impacts instead of one, then the insurance adjusters handling your case may blame you for causing the car accident. If the person in front of you felt two impacts, it implies that you hit them first and then the car behind you hit you again and forced you into the car in front of you again. The car that rear-ended you will argue that if you did not come to an abnormally abrupt stop, they would have had time to avoid the collision from occurring. If you find yourself in this situation, make sure to document the scene with as much detail as possible. Take pictures of all of the vehicles involved and at a variety of different angles. You will want to make sure that you capture the front and rear-end of all of the vehicles involved. This will help prove what happened and who is at fault. If you’ve been involved in a car accident and you’re not sure whose fault the car accident was, give us a call and we will help you – whether or not you have a case that we can pursue for you. We want to make sure that people who have been involved in a car accident have a place to turn to that they can trust. Case consultations are always free and without obligation. If you need a car accident attorney in West Covina, call Lem Garcia Law.